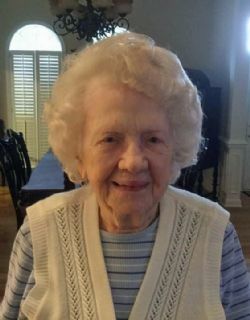 Virginia W. Blount age 98, died on Tuesday, January 1, 2019 in Mobile, Alabama. She was surrounded by her loving family. Virginia was born in Roberta, Kentucky. She moved to the Panama Canal Zone at the age of 9 and lived there until her retirement in 1976 and then moved to Mobile, AL. She worked for the US government through out her life in the Canal Zone. Virginia was preceded in death by her husband of 51 years, Edward C Blount Sr., her brother Hal Willett of Manito IL, and sister Ermin Highley of Dothan, AL. She is survived by her four children, Lucy B Rhyne (Steve), Edward C Blount, Jr. (Shannon), Nancy B Olijnyk (Ted), Rochelle B Finneman (Thomas), and three grandchildren, Carter Blount (Amanda), Kaitlyn Blount, and Colin Blount. Virginia is also survived by five nephews and nieces and many great nephews/nieces. Graveside services will be held on Saturday, January 5, 2019 at 12:00 pm at Mobile Memorial Gardens. The family will greet friends and viewing from 11:00-12:00 pm on Saturday, January 5, 2019 at the Mobile Memorial Gardens Funeral Home. A graveside will be held at 12:00pm on Saturday, 01/05/2019. Your mother had a wonderful personality and always had a calm matter of fact way of dealing with life’s ups and downs. She was a role model for me. Martha Goodwin on Charles Hazen Jr.
Memory Medallion® easily attaches QR codes to the surface of tombstones and memorials providing lasting, multi-media remembrance. Using a smartphone, simply read the barcode of a medallion to view the story, images and video associated with it.